Pittsboro, NC – Jordan Lake Boat Rentals is my most popular story ever. It’s had nearly 10,000 views. But a few significant things have changed on the lake in the last year, so this is an update to the original post. A bit of history – the marina concession on Jordan Lake is owned by the Army Corps of Engineers. It is lease-out for 30 year terms. The original concession was granted to Albert Urquhart 30 years ago, when the Corps was flooding-in the new lake behind the dam. In re-bidding the concession early this year, Urquhart lost out to a rival group. 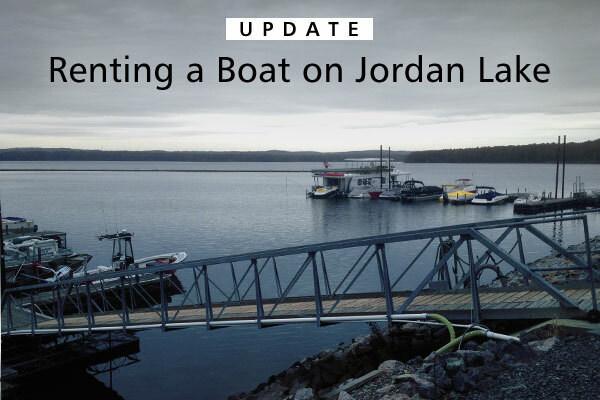 For a number of months, rumors and controversy swirled around the marina on Jordan Lake. People didn’t know if they’d need to remove their boats from the marina or if Urquhart would even sell his docks and improvements to the new owners. In May, Crosswinds Boating Center LLC, took over the 30-year lease. To the great pleasure of Jordan Lake boating enthusiasts, it’s been smooth sailing ever since. I met John Norton, one of the new owners. I can report that John and his crew have the marina looking spiffy and ship-shape. John said they have a waiting list for docking slips, so business is pretty good. Rental boats are back, with two different pontoon boats, a fishing skiff and kayak rentals. Plans for more rentals (including a sailboat) are in the works. There is a public boat ramp, ethanol-free gas, public restrooms and a convenience store. Three fenced boat storage lots and one fenced trailer lot (with limited covered storage). It’s great to see the marina thriving once again. And, if you’re looking to rent a boat on Jordan Lake, Crosswinds Boating Center makes it easy. See you on Jordan Lake!